Although they knew God they did not honour him as God or give thanks to him, but they became futile in their thinking and their senseless minds were darkened. Claiming to be wise, they became fools, and exchanging the glory of the immortal God for images resembling mortal man or birds or animals or reptiles. Therefore God gave them up in the lusts of their hearts to impurity, to the dishonoring of their bodies among themselves, because they exchanged the truth about God for a lie and worshipped and served the creature rather than the Creator, who is blessed forever! Amen. St.Paul to the Romans, 1: 21-25. It looks increasingly unlikely that Canada will build a pipeline through British Columbia allowing Alberta to ship its oil to the broader world. Yet Canadians appear unconcerned about the long-term consequences to their economy and themselves. For this you can blame the radical environmentalists who are carrying out their ‘religious’ duty to protect the ‘Earth’ – their god. Aka Gaia, the designated goddess of this New Age strain of that ancient religion known as pantheism. 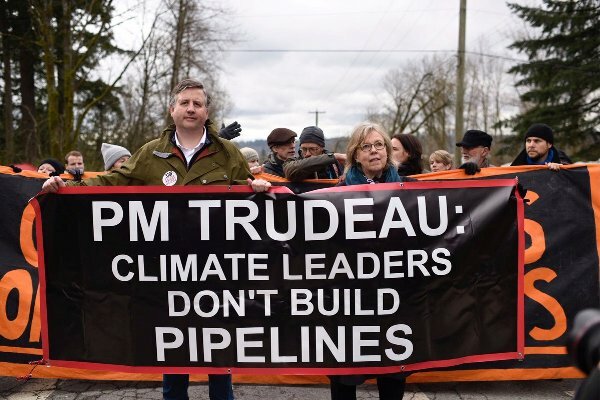 In fact, so convinced are these eco-extremists of the righteousness of their cause that their ruthless obstruction of the Trans Mountain pipeline project is threatening the Canadian economy, of which the oil business comprises more than 20 percent. Nor will they tolerate either the federal or Alberta governments providing a financial backstop to build the lone remaining pipeline that would release Alberta oil to the higher revenues of world markets. But the problem is much deeper. As National Post columnist Rex Murphy recently pointed out: the real obstruction to pipeline construction is the implacable opposition to any future development of the Alberta oilsands by the Green Party in B.C. where Andrew Weaver’s three-person party holds Premier John Horgan’s NDP in its ideological grip. The real threat, Murphy contends, is that regardless of any future court resolutions or any accommodations worked out between the Alberta and B.C. governments, there remains that power block of extreme environmentalism comprised of a legion of NGOs, Greenpeace acrobats, dubious think-tanks and ‘charities’, foundations, foreign and domestic, and radical Indigenous groupings — all of which subscribe to every dogma of the science-settled Church of the Latter Day Climate Change Apocalyptics. Murphy contends that all are professional scofflaws who claim the superior virtue of their self-declared mission — which is “saving the Earth” — trumps the law, government and the national economy. And the Paris Climate Accord is their holy grail. So, given what radical environmentalism has wrought in the past half century, the question remains: Who has the ultimate authority to decide Canadian energy policy? Provincial or federal governments? Or radical environmentalists? Apparently, this no longer matters because, on this file, Canada’s prime minister, Justin Trudeau, has been dragging his feet while consistently displaying near manic support for the Paris Climate Accord. When former U.S. president Barack Obama scuttled the Keystone XL, Trudeau was silent. Then, upon assuming office, he gummed up the works further by inanely imposing feminist gender analytics to oil projects. Which – if you’re a radical environmentalist – can only be viewed as a huge win. The Energy East pipeline was cancelled. As was Northern Gateway. And tankers have been banned off the B.C. coast. So now that Canada is in the peculiar position of being held hostage by a three-member-caucus fringe party who could easily choke her neighbour’s prosperity, should anyone be surprised that Kinder Morgan may soon close shop, leaving Alberta fuming, and Confederation seriously damaged? Such impasses do not spring up overnight. The bases of many of Canada’s current woes date back to 1970 when Canadian environmentalist Maurice Strong drew up his Earth Charter. And like the New Age cleric he was, he gave it a feast day – Earth Day, April 22 – marking the hundredth birthday of Vladimir Lenin who is the ideological preference of many of those filling the streets on Earth Day. “The real goal of the Earth Charter is that it will in fact become like the Ten Commandments.” Strong predicted in 1970. Now, nearly half a century later, as Christians around the world observed Easter and Jews, the Passover, the environmentalists have once again paid annual homage to “the Earth” with exercises in green self-righteousness. Does the proximity of these holy feasts and its unholy counterpart strike you as accidental? Back then, Strong’s goals appeared so virtuous, so healthy, so caring, particularly in a world already frightened out of its wits by the apocalyptic forecasts of populations ideologue Paul Ehrlich and the Club of Rome which in 1968 proposed its report Limits to Growth, a new mindset dominated by the concept of ‘sustainability’. Dig a little deeper and you’ll also discover, as journalist Elaine Dewar did by charting the links between key environmental groups, government and big business, that Strong’s focus on climate and environment was actually a Trojan horse for establishing his socialist agenda. It was Strong who created the United Nations Environment Program (UNEP) that in turn produced Agenda 21 and the false climate science of the UN’s Intergovernmental Panel on Climate Change (IPCC). Which was finally exposed in 2009 when a claque of scientists at University of East Anglia’s Climate Research Unit was found to be massaging data to make it fit their theories, squelching scientists who disagreed, punishing academic journals that didn’t toe the doomsday line, hiding their work from public view and even destroying it when it didn’t fit their template. Then, ten days later, the scandal got a whole lot worse when it was revealed that the mountain of data used to back up their climate change predictions has been lost. Lost! But never mind. All was quickly swept under the carpet by the mainstream media which ritually failed to report the findings of dissenting scientists, such as Dr. Tim Ball, who’ve been smeared as a ‘climate deniers’ and who’ve long been calling the claim that human CO2 is causing climate change the biggest deception in history. Yet there was more to this movement than its declared environmental concerns. Nearly fifty years on, not only have their hysterical forecasts not panned out, the movement — rooted in the establishment of a One-World New Age religion — has always had multiple goals which include furthering the eugenics agenda by arguing for the reduction of human populations around the globe. Under the noble-sounding umbrella of reversing ‘climate change’ as the enemy of the people, the Climate Change (formerly Global Warming) movement is really about governments and individuals gaining power and money by creating endless green energy boondoggles while simultaneously demonizing oil and coal companies and redirecting corporate activity towards ineffective, regressive and bankrupting climate “technologies of the future”. With carbon taxes loaded on! The ultimate goal? Not to make Bambi’s life more pleasant, I can assure you. Instead, it’s to put all economic activity under global control as directed by the UN, IMF, the Aspen Institute, the Club of Rome, the Tavistock Institute and a gaggle of other humanistic organizations. With that goal in mind, the Club of Rome in 1972 gave widespread publicity to their publication of the notorious Limits to Growth. Supported by research done at MIT, this report concluded that industrialization had to be halted to save the planet from ecological catastrophe. Naturally, widespread panic was induced, allowing these organizations and individuals such as the Malthusian biologist Ehrlich to turn his book The Population Bomb into a bestseller. What’s more, Ehrlich is still around, a recent sighting of which was at a Vatican conference in February 2017 where this undisputed father of the modern population control movement was asked to present a paper. And so it goes. Then, as now, only government action by anointed elitist saviours could save us from eco-Armageddon. Confirming yet again that all this has ever been is one giant elitist scam. An environmentalist circus replete with the usual clowns and useful idiots, eager to indulge the power cravings of the elites who pretend to care about the great unwashed who they’ve been terrorizing with their apocalyptic nonsense and whose pockets they’ve been robbing on the promise of salvation from the doom they’ve been selling so cleverly. P.T. Barnum would be laughing out loud! Nevertheless, eradicating God from the human mind and culture is hard work. So is rejecting God’s bounty. Propaganda had to be developed; grants had to be made to ‘scientists’ happy to produce the desired data via computer models; books and pamphlets had to be printed; movies made; and ‘experts’ paraded across TV screens to fool the masses into believing that Man, not God, has the power over nature needed to solve the problem Elitist Man invented. So, to reduce the ‘surplus population’ as Ebenezer Scrooge recommended in A Christmas Carol, men must be persuaded that they are not children of God, made in His own likeness and image, but rather a pestilence on the face of the Earth, a mere carbon footprint that must be guilted and frightened into cooperating in his own eradication. A clever scheme, is it not? And so reminiscent of an earlier scenario in human history, the temptation of Adam and Eve in the Garden of Eden. Which brings me back to the human cull that’s been going on since at least the legalizing of abortion in Canada in 1968 under Prime Minister Pierre Trudeau and the Roe v Wade Supreme Court decision of 1973, legalizing abortion in the U.S.
And more recently, the taxpaying rabble has also found itself pressured to accept free abortion pills, legal euthanasia and assisted suicide as yet more “compassionate” measures ordered by our “betters” who oversee our increasingly dysfunctional socialistic medical systems. Which also brings us back to Lenin, that decaying reminder of central planning and the icon of Earth Day who had no respect for life, who declared certain people “harmful insects” and of far less value than, say, a dolphin. Has all this been an accident of history? Or the fulfilment of an elitist’s idea of Progress? Licking this earth! A more apt phrase describing this fifty year venture has yet to be coined.